​This book is a lovely, easy-to-read insight into life sailing the world on a yacht. Rosemary includes much technical sailing content; essential knowledge when a yacht is your home, sometimes with weeks between land. Tara, the unruly, free-spirited terrier is the star of the show, living an amazing sea-faring life that any canine would envy. Living at sea, she transfers the usual terrier vivaciousness of rat-catching to hunting fish and even a shark! Rosemary and Robert never needed worry about pirates with Tara guarding the boat fiercely. She always showed the tenacity that all terriers possess even when falling overboard! ​With laughs, tears, trials and tribulations of a canine source, this book will be thoroughly enjoyed by adventurous dog-lovers. 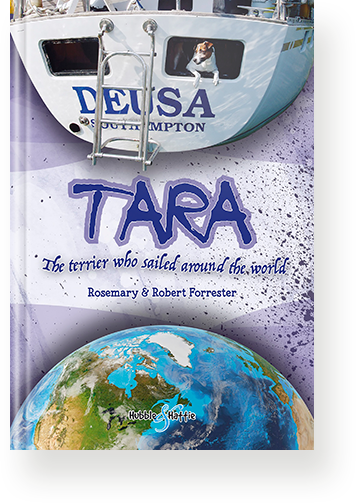 ​"Tara, the terrier who sailed around the world” is the exciting and touching story of a Jack Russell who had at least nine lives – and many more adventures – with her owners, Rosemary and Robert Forrester, as they sailed around the world on a yacht. The story begins when Robert flies from Columbia to Florida to buy some essential boat parts, and returns with a six-week-old puppy. Rosemary is both delighted and anxious: how will a dog as lively as a Jack Russell adapt to living at sea? This tiny dog has to learn how to keep her balance on a boat which is tilting sideways one minute, then crashing down on a wave the next; how to find a way to play ball without being washed into the ocean; how to learn to eat fish instead of meat; how to swim in the sea and get back on the boat; how to see-off all potential intruders, including marauding seagulls and customs officials. Above all, Tara has to learn how to survive when she is washed overboard – not once, but twice. Rosemary recounts their incredible adventures as they sail from the Panama Canal to Australia, and on to Malaysia and Thailand, where they survive the Boxing Day Tsunami. Finally, their journey takes them through the Indian Ocean to Mozambique, where Tara ends her days. For animal lovers everywhere – especially those who like travel and sailing boats – this is an emotional and uniquely entertaining tale.